Gratitude. I bet a lot of A-Z bloggers will pick Gratitude. I am grateful for big and small things, and small things that could be big things. I am thankful for my sight and my hearing. I am thankful that my neck doesn't hurt and I don't have a tooth ache. I am grateful that I am safe and loved. I believe gratitude is an important piece of having a positive perspective on life so I started a Gratitude Bowl in my house and on my kids' daily chore sheet, adding to the Gratitude Bowl is on there - it's there like a chore, but really it's a reminder so that we actively practice gratitude. Not all things come inherently, day in and day out. We need reminders and tangible, frequent ones. They started by adding generic papers saying "my mom" or "my dad" and evolved to specific notes like my scooter, the Christmas tree, or my dog's nose. I hope this practice reminds them that there is always something to be thankful for and always a positive position to take amidst the unfairness that will inevitably come. 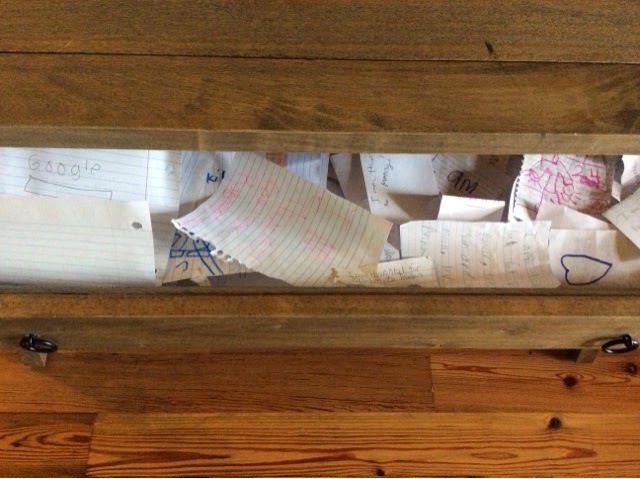 The Gratitude Bowl, of course, overflowed because we've been doing this for about a year now, so it evolved to a drawer. When I look in this drawer, it warms my whole soul with a beauty that is almost painful. My little children have followed their chores and have written what was in their heart, that day, what made them happy, what they appreciate. I started the idea, but they've done it and liked it and surpassed any tangible example of practicing gratitude by any adult I know. It is overwhelming for me to look in that drawer. I am so grateful! I asked them to do it and they reflected back to me how it's done well. I hoped it would extrapolate for them into an adult life well lived, but they have showed me it's right now, each moment, that is gratitude inducing. Good things come from good people and that is the gratitude we all need.